Over the past two weeks, sockeye have stood out in more than one way in the Northwest. A record run is moving up the Columbia, for starters, and there’s been enough on the Baker and Skagit Rivers to not only open a season, but extend it as well as open up Baker Lake for the first time ever. Of course, we’ve been blogging about the buggers, and all that sock talk’s been drawing folks to our Web site. On the WordPress side of things, sockeye has been one of the most common search terms for awhile now. 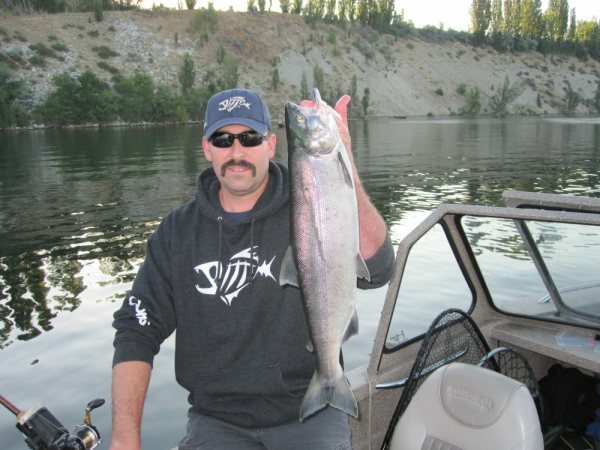 Well, today someone who may or may not be Northwest Sportsman writer Jason Brooks did also google “steelhead record breaker jason brooks,” but enough of that. As fish numbers mount in the upper Columbia, anglers are beginning to seriously target the red salmon in the Brewster Pool. One of those gents doing so is Scott Fletcher. 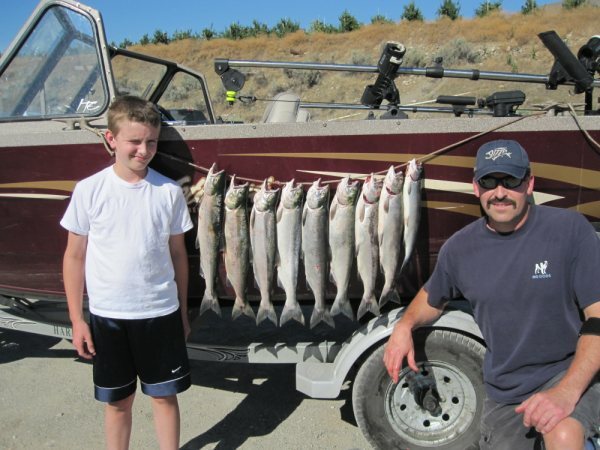 Last Thursday, he beat feet out of the Wenatchee area to get onto the reservoir before sunlight hit the water, scoring a pretty respectable sockeye, a 4.8-pounder. It was on two #1 hooks about 2″ apart, one red on the bottom and one black with 12″ leader and OO chrome dodger. The depth that day was at 15′ down but the trip before was at 25′ down. The bite at Brewster seems to be early between 5:00 and 8:00 am. Just a wee bit ago, Fletcher emailed me another shot, this one of nine sox he and his son, Tyler, caught today. They all weighed between 2.8 to 4 lbs. We caught them at 20′ down today. For more on the emerging sockeye fishing on the Brew Pool, check out Leroy Ledeboer’s story from our July issue. This entry was posted on July 22, 2010 at 11:28 pm and is filed under EDITOR'S BLOG. You can follow any responses to this entry through the RSS 2.0 feed. You can leave a response, or trackback from your own site.